The Cameron School of Business is part of the University of St. Thomas, the only Catholic university in the Archdiocese of Galveston-Houston. The Basilian Fathers founded the university in 1947. More than 70 members of the Basilian Fathers community have served the university. The members help to ensure that the university provides a Catholic liberal arts education to its students. The Cameron School of Business was added to the university in 1979. The school focuses on ethically-oriented business education that will provide the school’s graduates with the skills necessary to serve as leaders of faith in a global economy. The Cameron School of Business is located at the University of St. Thomas. The university is located close to downtown Houston, near the museum district. The school is also located close to the Texas Medical Center and the Galleria. 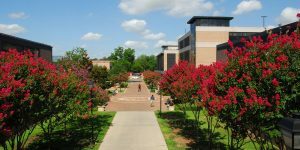 The main campus is located less than 25 miles from the George Bush Intercontinental Airport in northern Houston. The University of St. Thomas offers career services to all of its students. The career services and testing center features two licensed professional counselors on staff to help students and alumni with career development and beginning meaningful employment. Because the university is a service-oriented campus, there are many opportunities for students to participate in service projects in the community. The career services center also provides students with information on internship opportunities and career options. Students at the university also have access to the Centers for Excellence. The Centers for Excellence at St. Thomas features six different centers that each have a specific focus and aids students in education by sponsoring debates, lectures, conferences and publications. The centers include the Center for Faith and Culture, The Center for International Studies, The Center for Irish Studies, The Center for Thomistic Studies, the McNair Center for Free Enterprise & Entrepreneurship and the Center for Ethical Leadership. The Cameron School of Business faculty features experts in accounting, economics, management, and marketing. Some areas of specific research expertise of the faculty include forensic accounting, corporate social responsibility, finance, investments, financial planning, strategic marketing, branding, and business strategy. The faculty members are highly published with many having current professional involvement. The current student-to-faculty ratio is 10:1 at St. Thomas and 16:1 in the Cameron Business School. Students come from a diverse range of educational and spiritual backgrounds. As of recently, the university was home to 1,814 undergraduate and 1,498 graduate students. The Cameron School of Business offers a MBA program with classes offered in the evenings and on Saturdays. The school also offers a combined five-year BBA/MBA, as well as other joint MBA offerings.